Remedy began with a quick success story. 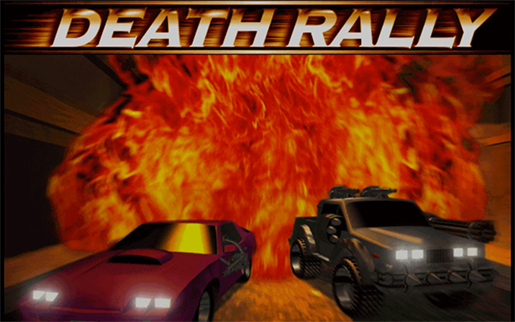 Formed in Espoo (Finland), in summer 1995, the team celebrated their first game launch, Death Rally, in autumn 1996. While the studio is best known for Max Payne, Alan Wake and Quantum Break, their beginning focused on a much smaller scale project, taking just a few months to do with a handful of developers. 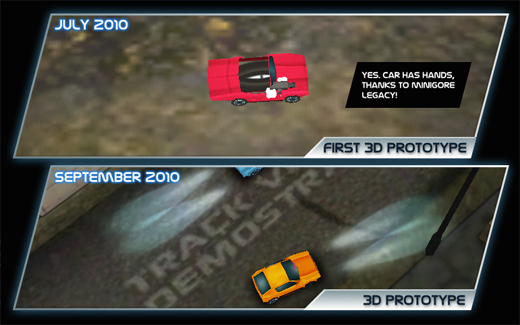 The success of the top-down racer which proved to the team that they had a successful company to move onto bigger things. This is how Remedy and Death Rally began. Remedy has its origins in the Demoscene, an international subculture where groups strive to push computers to their technical and artistic boundaries. Despite the shared goal, there was a sense of competition with multiple factions working on multiple systems, eager to prove their strengths. Yet, it was from this desire to push expectations which kindled the interest to move onto games, creating a communication between groups. Remedy began to take form when members of Future Crew (focusing primarily on PC) contacted The Aggression (focusing primarily on Atari ST), with a proposal to start a games studio. The combined interest led to a third group being formed, Remedy. The original Remedy logo as seen in the Death Rally opening. This was later changed in April 1999. While prototypes existed before Remedy's formation, the real work on their debut title began after. In the games industry today, it's not uncommon for development studios to spend a year or two exploring potential ideas for their next title, but for Death Rally it's conception was almost instantaneous. "We were just making it up as we went," says Sam Lake (Creative Director at Remedy) in the interview with Complex, stating that the team had a very fast work pace as there were no long debates over decisions. "It was the first idea, and we went ahead with that." Through their background in the Demoscene, Remedy had entered the games industry with a number of contacts at fellow studios, including 3D Realms. It was with them that a publishing deal was struck. Remedy visited the offices on Thanksgiving Day Eve (22nd of November 1995) with an early demo. Following a positive reception, a contract was signed just a few weeks later. 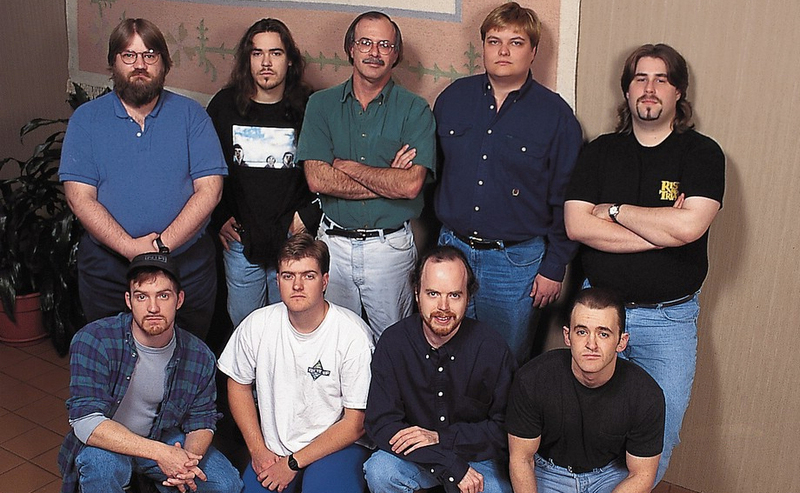 The team at 3DRealms in 1995, when development on Death Rally began. Photo from the company's web archives. The partnership was beyond a typical developer-publisher relationship, with 3DRealms providing support to encourage the studio to grow, as well as providing constant feedback on the game. In fact, it was at 3DRealms' request that guns should be added to the game. It was also due to their partnership that sparked the creative decision to incorporate 3DRealms' leading man, Duke Nukem, as one of the player's competitors. For the original 1996 version, Duke was the only character who spoke in the game and during the development stage there were talks about adding even more dialogue in for his cameo. The final version of Death Rally took players on the dangerous career path. More wins meant more money which could be put towards armour upgrades or new weapons, sometimes that meant doing business with shady individuals. Races could descend into chaos easily with sabotage being in the minds of all the drivers. 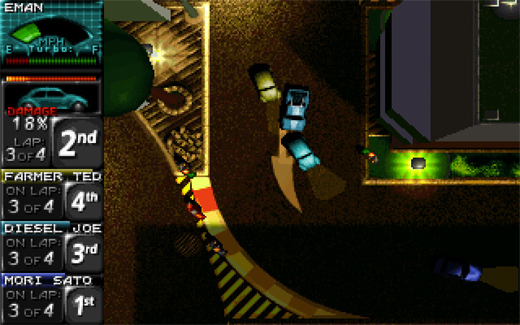 The game featured six customisable vehicles which could be driven around nineteen different tracks, and also allowed up to four player multiplayer. Promotional render for the 1996 version of Death Rally. The launch of Death Rally soon put Remedy on the map. According to Hugi, a magazine which focuses on the Demoscene, the title sold over 120,000 copies, a massive hit for the start-up company in 1996. "Death Rally, back then, was a hit," Lake describes in The Story of Remedy documentary. "And we were definitely going to other games, we knew that." Still working from a basement, the project's success encouraged the team go further with their ideas. The team expanded and embraced a stronger focus on storytelling, something which became an iconic element of Remedy's identity's in the following years. In 2001, Remedy released Max Payne, followed by its sequel in 2003. In 2010, they released Alan Wake, and it's spin-off title, Alan Wake's American Nightmare, in 2012. Their latest project was Quantum Break, released April 2016. Despite going onto new projects, the team often returned to their original IP. 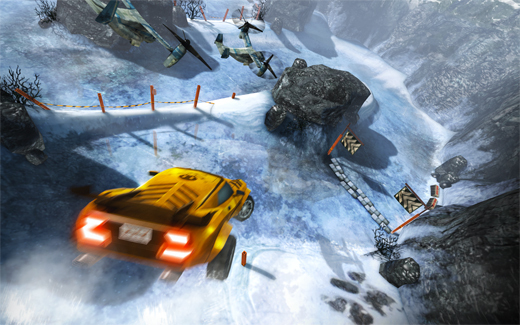 In May 2009, Jari Komppa, known for his success in Assembly demo competitions, contacted Remedy about creating an open source version of Death Rally. Initially a "maybe," an investigation soon followed, looking into the legal and practical side of the project. The first proposal focused on making Death Rally open source, allowing its source code to be available to study, change or distribution. That wasn't possible. But the project didn't die then. Despite open source not being an option, there was interest in making a freeware version of the game, allowing for a new audience to download and play the game for free. By mid-July of that same year, work began on the project. Rumours about a new Death Rally title began circulating in early October 2009 following a trademark filed by Remedy, but concrete news was soon to follow, with the freeware version of the game released just three weeks later. The program was available to download via gaming website, Joystiq, until its closure in February 2015. Official screenshot from the original game. Yet, the trademark could have also been seen as a hint of things to come. Indications that Remedy were looking to return to the Death Rally IP followed the reveal of the freeware version. From their official FAQ at the time: "Death Rally is not "abandonware" and Remedy has only made the Windows re-release free according to the license agreement included in the installation package. Distributing the full DOS version is illegal." Less than a year later, they were in talks for officially returning to the franchise. Remedy returned to the Death Rally series, publishing the game in 2011 on iOS, Android, and later Kindle Fire. Moving into the mobile gaming space was a new experience for Remedy, with the team having to adjust to new competition and challenges to get their game noticed. The effort is profitable but with 30,000 new apps being submitted to Apple each week, as reported in 2012 by BGR, doing something exceptional was tough. To bring reimagine the classic, Remedy teamed up with newly established developer, Mountain Sheep. Comparison by Mountain Sheep, posted on their Death Rally dev blog. Speaking to IndustryGamers.com, Aki Järvilehto talked about returning to the developer's first IP. "The reception was astounding, which brought us to realize the potential of this little game that we always thought was brilliant in many ways." The next stage was to decide how to bring the game to a more modern audience. "We started to toy around with different concepts and the iOS platform as a starting point immediately felt right." Screenshot from the 2011 remastered version of the game. Not all ideas could be implemented into the game, leaving several interesting pursuits on the cutting room floor. According to VentureBeat, one of these early ideas including bringing a level designer option to Death Rally, and allowing the community to create and play user generated content. Marketing for a tablet game was a new experience for Remedy, who mainly relied on promotional material produced in-house and at Mountain Sheep. Originally marketed at $4.99, Death Rally was reduced to $2.99 after a short amount of time on the store to make it more accessible to a new audience. Fierce competition on the App Store soon saw the price further reduced to $0.99. At the time the game didn't have micro-transactions, which meant that for the first few months after the game's launch, the developers relied solely on sales of the game. Promotional render by Heikki Repo (Mountain Sheep) showcasing Eureka, a new level available in one of the updates. Following the launch on iOS and Android, the Death Rally Facebook page asked followers to help shape the game by suggesting upgrades or additions they would like to see. Updates for the title saw the introduction of new guns, cars, and multiplayer on October 2011. For the Facebook page, fans could not only submit their own suggestion but vote for the suggestions they liked best. Winning participants were awarded prizes ranging from iOS codes to a Death Rally themed iPad. Suggestions included adding a school bus a playable vehicle, "Spiked Monster Truck of Doom" and a Dune Buggy with a fibreglass rollcage. In 2012, sixteen years after it's original launch, Death Rally returned to PC. The game launched on Steam on 3rd August, with attendees of Assembly getting an exclusive first look the previous day. The remastered version included a series of new changes from its mobile edition to better suit it's new platform. 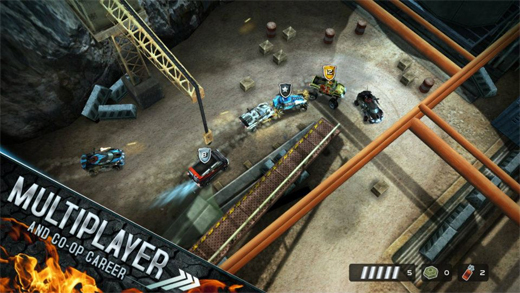 While the heart of the mobile version remained, the title's menu system and multiplayer feature were overhauled, allowing up to six drivers to compete in the same race. Bringing the IP to mobile proved to be a success for Remedy. By December 2012, nine months after it's release, the developers reported 1.5 million downloads for the game. The number skyrocketed to 10 million downloads and 100 million play sessions by June 2012; eight million on iOS devices and two million on Android, reported by gamesindustry.biz. By August of the following year, the total number of units shipped rose by a million with the total number of playsessions increasing to 150 million. The game generated an income of $50,000 per day while on the top five game chart, with reported average monthly income of between $50,000 - $350,000. For four years, revenue brought in from the title had a 40/60 split between game downloads and in-game purchases. That split was obviously altered in June 2015, when the title became a free-to-play game. Promotional image from Remedy's Twitter page. 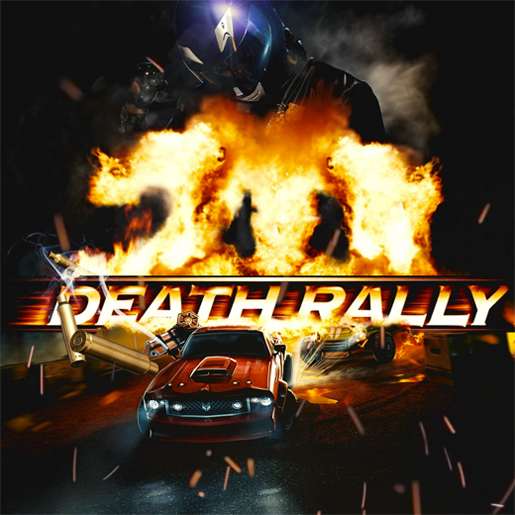 Following's launch in 2011, Death Rally collected a number of nominations: Excellence in Gameplay (International Mobile Gaming Awards West), Best Nordic Handheld Game (Nordic Game Awards), Best Handheld Audio (Game Audio Network Guild). By December 2011, Death Rally hit the US Apple Store's Hall of Fame. Critically the game was a success too with review scores of 5/5 stars by TouchArcade, 4/5 stars by AppSpy and 8/10 by Destructoid. Despite celebrating its 20th anniversary this year, Death Rally has frequently proved that it has all of the elements of being a timeless classic. In 1996, the game gave Remedy enough confidence and momentum to move into new and more ambitious projects. Thirteen years later, the freeware version proved that there was still active interest in the franchise, prompting the developer to return once again to it's first franchise. Two later after, the remastered version was introduced to a brand new audience with enormous success, recouping the entire development costs in just three days. While Remedy is now recognised for its AAA titles, without a doubt Death Rally played the most important part of the company's history - it made Remedy happen. If you liked this article and want to read more about Remedy's history, I recently posted a piece on the original Max Payne game. Click HERE to read it.